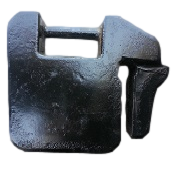 Front tractor weights and suitcase weights for John Deere, Kubota, Case, International, Mahindra, Massey Ferguson, New Holland, Challenger and more. Brand new cast iron counterweights and ballast weights. 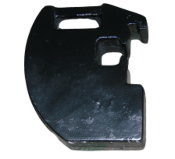 Skid steer weights for Kubota, New Holland, John Deere and others. We can color match most brands. Taylor Foundry offers our complete line of TAYFYCO® tractor weights to all branded farm equipment dealers and select distributors. Please contact us to set up your account, obtain pricing, discuss products or determine fit. 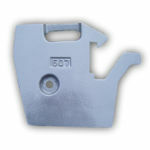 TF 0100 Universal Suitcase Tractor Weight. 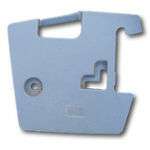 Uses F-2339, C-12, AND F-3040 Brackets. Requirements: Locking Bolt, Nut, Washer required. New Universal Suitcase Weight. Front Weight. Tractor Weight. 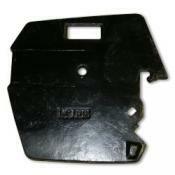 This weight has many applications and will work on many tractors with correct bracket. WILL FIT CASEIH, NEW HOLLAND, KUBOTA and many more. M6800, M8200, M9000, M5040, M6040, M7040, M8540, M9540, M95S, M105S and others. 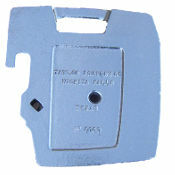 TF 0167 Universal Front Tractor Weight. Requirements: Locking bolt, nut, and washer is required. Brand New Casting. Gloss Black Paint. 86 pounds each. We can Color Match Most Brands. TF 173 Factory Type Front Tractor Weight for Case, New Holland, Deutz-Fahr. Used for many CASE Maxxum models and NEW HOLLAND T6000 - T7000. Requirements: Locking Bolt, Nut and Washer Required. Factory Type front weight, suitcase weight. 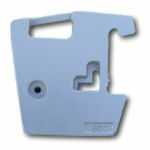 Correct mounting bracket required for all applications. 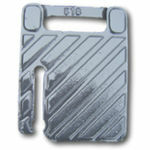 TF 181 Factory Type Front Suitcase Weight for Case and New Holland Tractors. Fits CASE-IH. 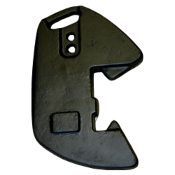 factory brackets. For Current Model CASE I.H. Tractors, For New Holland TJ Series and T9000 Series. Used on Massey Ferguson Compact Tractors. Agco, Massey, Deutz Fahr, TYM, others. TF 334 Front Weight, Massey, Challenger, Mahindra, others. Will Fit Many MASSEY FERGUSON Brackets. Brand New Casting. Front Weight. Suitcase Weight. Many applications and models not listed. Massey Ferguson 231, 231S, 240, 241, 243, 253, 261, 263, 271, 273, 281, 283, 360, 362, 363, 364, 365, 373, 374, 375, 377, 383, 384, 387, 390, 393, 394, 396, 397, 398, 399, 431, 435, 440, 451, 460, 461, 465, 471, 475, 481, 491, 492, 496, 533, 543, 550, 563, 565, 573, 575, 583, 590, 592, 593, 595, 596, 2605, 2615, 2620, 2625, 2635, 2650, 2650HD, 2660, 2660HD, 2670, 2670HD, 2680, 2680HD, 3120, 3125, 3140, 3315, 3315GE, 3315S, 3315V, 3330, 3330S, 3340, 3340F, 3340V, 3350, 3350F, 3355, 3355F, 3355GE, 3425, 3425GE, 3425S, 3425V, 3435, 3435V, 3445, 3455, 3455GE, 3505, 3525, 3545, 3625, 3630, 3635, 3645, 3650, 3655, 3660, 3670, 3680, 4225, 4233, 4235, 4243, 4245, 4253, 4255, 4260, 4263, 4270, 4325, 4335, 4345, 4355, 4360, 4370, 4608, 4609, 4610, 5425, 5435, 5445, 5450, 5455, 5460, 5460SA, 5465, 5470, 5470SA, 5475, 5475SA, 5480, 5609, 5610, 5611, 5612, 6150, 6170, 6180, 6255, 6265, 6270, 6280, 6290, 6465, 6475, 6480, 6485, 6490, 6495, 6497, 6499, 6614, 6615, 6616, 7465, 7475, 7480, 7485, 7490, 7495, 7497, 7499, 7614, 7615, 7616, 7618, 7619, 7620, 7622, 7624, 7626, 8120, 8130, 8140, 8150, 8160, 8220, 8240, 8245, 8250, 8260, 8270, 8280, 8450, 8460, 8470, 8480, 8650, 8660, 8670, 8690 and others. AGCO DT205B, DT225B, DT250B, DT275B, GT45, GT45A, GT55, GT55A, GT65, GT65A, GT75, GT75A, LT85A, LT95A, RT100A, RT110A, RT120A, RT140A, RT155A, RT165A, RT180A and more. Challenger MT425B, MT445B, MT455B, MT465B, MT475B. Deutz Fahr F310 Agroplus, F320 Agroplus, F410 Agroplus, K90 Agrotron, K100 Agrotron, K105 Agrotron, K110 Agrotron, K115 Agrotron, K120 Agrotron, M600 Agrotron, M610 Agrotron, M620 Agrotron, M640 Agrotron, M650 Agrotron, S70 Agroplus, S75 Agroplus, S80 Agroplus, S85 Agroplus, S90 Agroplus, S95 Agroplus, S100 Agroplus, S320 Agroplus, S410 Agroplus, S420 Agroplus, TTV610 Agrotron, TTV620 Agrotron, TTV630 Agrotron, TTV1145 Agrotron, TTV1160 Agrotron, X710 Agrotron, X720 Agrotron, 35 Agrokid, 55 Agrokid, 57 Agrolux, 60 Agrolux, 67 Agrolux, 67 Agroplus, 70 Agrolux, 77 Agroplus, 85 Agrofarm, 87 Agroplus, 100 Agrofarm, 120 Agrotron, 135 Agrotron, 150 Agrotron, 150.7 Agrotron, 180.7 Agrotron, 210 Agrokid, 215 Agrotron, 220 Agrokid, 230 Agrokid, 265 Agrotron, 310 Agroplus, 320 Agroplus, 410 Agrofarm, 410 Agroplus, 410 Agrotron, 420 Agrofarm, 420 Agrotron, 430 Agrofarm, 610 Agrotron. 46 kg each. Color Options Available. Brand New Casting. Color Match Available. Fits Case IH, Farmall 65A, Farmall 65C, Farmall 70, Farmall 75A, Farmall 75C, Farmall 80, Farmall 85C, Farmall 90, Farmall 95, Farmall 95C, JX1060C, JX1070C, JX1085C, JX1095C, Maxxum 110, Maxxum 115, Maxxum 120, Maxxum 125, Maxxum 130, Maxxum 140, MXM120, MXM130, MXM140, MXM155, MXM175, MXM190, Puma 115, Puma 125, Puma 130, Puma 140, Puma 155, 385, 395, 485, 495, 585, 595, 685, 695, 785, 795, 885, 895, 995 and others with correct bracket. 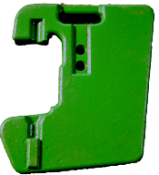 Fits International Tractor, Hydro 70, Hydro 86, Hydro 100, Hydro 186, 274, 284, 464, 544, 666, 674, 686, 766, 786, 886, 966, 986, 1066, 1086, 1466, 1468, 1486, 1566, 1568, 1586, 2400, 2500, 2544, 3088, 3288, 3488, 3688, 5088, 5288, 5488 and others with correct brackets. 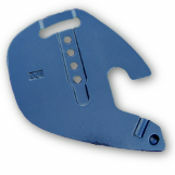 Fits International Combine, 815, 915, 1460, 1480 and others. Fits Kubota Tractor, M100GX, M100X, M108X, M110GX, M110X, M125X, M126GX, M126X, M135GX, M135X, M4030, M4700, M4800, M4950, M5030, M5040, M5140, M5400, M5700, M5950, M6030, M6040, M6800, M6950, M7040, M7040SU, M7950, M8030, M8200, M8540, M8560, M8580, M8950, M9000, M9540, M9580, M9960. Call for more information. Very popular model for use on competitive and recreational pulling tractors. 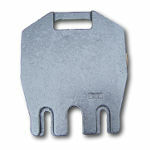 This weight is still in use on a variety of implements and custom applications. Please call with your requirements. Old Style International Front Suitcase Style Tractor Weight. 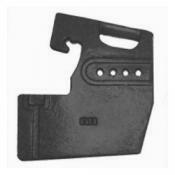 Available in many colors and with or without angle iron slot. Not all applications are shown. 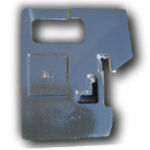 Fits Kubota Tractor B1550, B1700, B1750, B2100, B2150, B2320, B2400, B2410, B2620, B2630, B2650, B2710, B2910, B2920, B3030, B3200, B3350, B4200, B5000, B5100, B5200, B6000, B6100, B6200, B7000, B7100, B7200, B7300, B7400, B7410, B7500, B7510, B7610, B7800, B8200, B9200, BX1500, BX1800, BX1830, BX1850, BX1860, BX1870, BX22, BX2200, BX2230, BX23, BX2350, BX2360, BX2370, BX24, BX25, BX25D, BX2660, BX2670, L2350, L2500, L2550, L2600, L2650, L2800, L2850, L2900, L2950, L3000, L3010, L3130, L3200, L3240, L3250, L3300, L3301, L3350, L3400, L3410, L3430, L3450, L3500, L3540, L3560, L3600, L3650, L3710, L3800, L3830, L3901, L3940, L4060, L4200, L4240, L4300, L4310, L4330, L4350, L4400, L4600, L4610, L4630, L4701, L4740, L4760, L4850, L5030, L5040, L5060, L5240, L5450, L5460, L5740, L6060, M7030DTN-B, M7030N, MX4700, MX4800, MX5000, MX5100, MX5200 and others. Call for details. 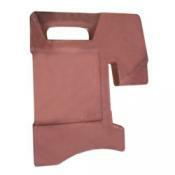 Fits Kioti Tractor CK20, CK20HST, CK20S, CK20S HST, CK25, CK2510, CK2510 HST, CK25HST, CK27 HST, CK30, CK30HST, CK35, CK35HST, DK35, DK35SE, DK35SE HST, DK40, DK40SE, DK40SE HST, DK45, DK45S, DK45SE, DK50, DK50SE HST, DK55, DK65, DK65S, DK75, DK90, DS3510, DS4110, DS4110HS, DS4510, DS4510HS, LB1914, LK2554, LK30, LK3054XS, NX4510, NX5010, NX5510, NX6010, RX6010, RX6620, RX7320. 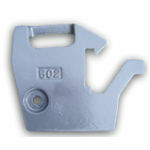 Can replace Kubota BL8060 in many applications. 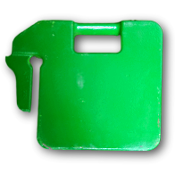 This is an aftermarket weight often used in place of Kubota BL8060 front suitcase weights. 25 lbs heavier than their original version. Will fit the same brackets while providing more weight, better traction and improved handling. Kubota Front Weight 115 Pounds. Fits Kubota M Series Tractors. Also see TF-807 for the 100 pound model. Fits all Kubota M Series Tractors. Available in Gloss Black original style or Kubota Orange. For Kubota Compacts and others. Fits Kubota compacts and many others. 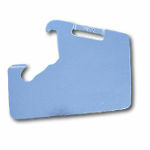 Fits Brackets R117599, R70417, AR92425, R82549 and others. Use the form below to request pricing or other information. 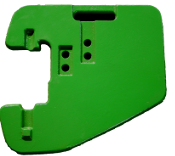 TF 656 Front Compact Weight for Deere, CNH, and others. Color Matched to Your Brand. Will fit many applications including Heavy Hitch products. Agco ST25-ST33, ST34-ST55, ST22A, ST24A-ST60A. 2210, 3203, 4100-4700, 4100N, 4010-4710, 4115 and MANY others. 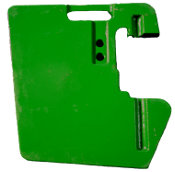 John Deere 318D, 319D, 320D, 323D, 326D, 328D, 329D, 332D, 333D, 318E, 319E, 323E, 326E, 329E, 333E, 320E, 328E, 332E, 324E, 330G, 331G, 332G, 333G, and others. TF 660 Front Weight for Deere, CNH, others. We will color match most brands. Fits Kubota Tractors M100GX, M100X, M105S, M105X, M108S, M108X, M110, M110GX, M110X, M120, M125X, M126GX, M126X, M128X, M135GX, M135X, M4700, M4800, M5040, M5140, M5400, M5640SU, M5700, M6040, M6060, M6800, M7040 , M7040SU, M7060, M8200, M8540, M8560, M9000, M9540, M95S, M95X, M96S, M9960, M6 and M7 models. TF 808 Weight for New Holland, Kioti, Bobcat, CaseIH, Mahindra, Tym, others. Brand new casting. Gloss Black. Can replace OEM No. 710215036, 710215046, 710215006, 7158255, 86590435, 86604181, 87030623, 87440222, 710215016, 79018812 and others. Universal weight for Bobcat Tractors. Case IH D25, D29, D33, D35, D40, D45, DX18E, DX21, DX22E, DX25E, DX26, DX29, DX31, DX33, DX34, DX35, DX40, DX45, DX60, Farmall 30B, Farmall 30C, Farmall 31, Farmall 35, Farmall 35B, Farmall 35C, Farmall 40, Farmall 40B, Farmall 40C, Farmall 45, Farmall 45A, Farmall 50, Farmall 50B, Farmall 50C, Farmall 55, Farmall 55A, Farmall 60 and others. New Holland Boomer 8N, Boomer 30, Boomer 35, Boomer 40, Boomer 50, Boomer 1020, Boomer 1025, Boomer 1030, Boomer 2030, Boomer 2035, Boomer 3040, Boomer 3045, Boomer 3050, Boomer 4055, Boomer 4060, T1010, T1030, T1110, T1510, T1520, T1530, T2210, T2220, T2310, T2320, T2330, T2410, T2420, TC18, TC21, TC21A, TC21DA, TC23DA, TC24DA, TC25, TC26DA, TC29, TC29DA, TC30, TC31DA, TC33, TC33DA, TC34DA, TC35, TC35A, TC40, TC40A, TC45, TC45A, TC48DA, TC55A, TC55DA, TZ18DA, TZ22DA, TZ24DA, TZ25DA, Workmaster 35, Workmaster 40, Workmaster 45, Workmaster 55, 1110, 1215, 1220, 1320, 1520, 1530, 1620, 1630, 1715, 1720, 1725, 1910, 1920, 1925, 2120, 3415 and others. eMax 22L, eMax 25L, eMax 22, eMax 25, 2638, 4025, 4540, 5545, 5570, 2538, 2540, 6530, 5570, 4010, 6025. Mahindra Tractor Weights. TYM T233, T293, T300, T350, T353, T433, T500, T503. Fits Ford Tractors TW5, TW15, TW25, TW35, 5110, 5610, 5610S, 5640, 5900, 6410, 6610, 6640, 6710, 6810, 7410, 7610, 7710, 7740, 7810, 7840, 7910, 8210, 8240, 8340, 8530, 8630, 8730, 8830. TF 827 Factory Type Front Weight for Versatile, New Holland. 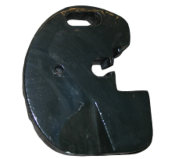 New Casting, contact us for more information. Available in Black or Versatile Red. TF 829 Weight for New Holland Sid Steers and more. New Holland Skid Steer L140, L150, L160, L170, L175, L180, L190, LS140, LS150, LS160, LS170, LS180, LS190, LS180B, LS190B, LX465, LX485, LX565, LX665, LX865, LX985. TF 831 Front Weight New Holland and others. Not all applications and models are listed. Boomer 2030-4060, Boomer 8N, TX18DA-TX25DA, TC18-TC45, TC21A-TC55A and others. TYM T300, T350, T353, T433, T500, T5. Brand New Casting. Color Choices Available. 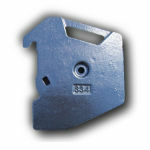 MT455D-MT95D, MT515D-MT595D, MT515E-MT545E, MT555E-MT595E, MT645DMT685D, MT645E-MT685E, MT745D-MT765D, MT755E-MT775E, MT835C-MT875C, MT845E-MT875E, MT945C-MT975C, MT955E-MT975E, MT425B-MT475B, MT635B-MT665B, MT645C-MT675C, MT735-MT765, MT745B-MT765B, MT745C-MT765C, MT835-MT865, MT835B-MT875B, MT945B-MT975B. Tractor weights for: John Deere. Kubota. Challenger. Kioti. Mahindra. New Holland. Massey Ferguson. TYM. Branson. Agco. Agco-Allis. Agco-White. Bobcat. Claas. Deutz-Fahr. Case. International Harvester. LS Tractors. Taylor Foundry was established in 1925. 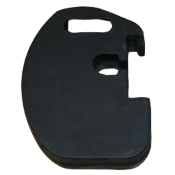 We have been heavily focused on the manufacture of tractor weights for over fifty years and offer the most complete line of tractor weights available anywhere.